Let the countdown 'til Christmas continue with DAY 14! Christmas music is key during the holiday season. Every festive occasion has a soundtrack of classic hits playing in the background. Even the most mundane routine can be saved. For me, the morning commute to work on the subway is a cheerless experience. But with Christmas music, the activity becomes much more enjoyable. 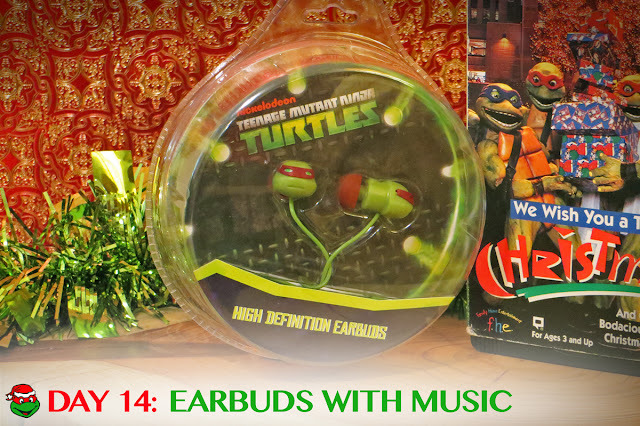 The best way to accomplish this as a TMNT fan is with this jolly combo - TMNT earbuds & the We Wish You A Turtle Christmas soundtrack. This duet of Turtle merch mixes the past and present. 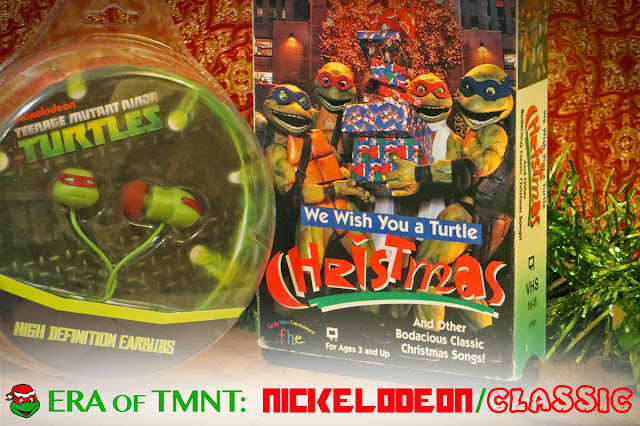 The earbuds are current technology, a release from Nickelodeon's TMNT series. The sleek design is a cue taken from Apple, with a mutated facelift to make it more Turtley. The We Wish You A Turtle Christmas VHS is outdated technology at its best - dripping with nostalgia, bad design & and an even worse product. We all know how infamous this video is. It's a painful viewing experience at any age. But strip away the visuals, and the soundtrack is not as brutal. I'm not saying it's good, because it's not. But as music only, it's lively and semi-entertaining. It's also the only option for seasonal TMNT songs. Beggars can't be choosers. Years ago I captured all the songs from the We Wish You A Turtle Christmas VHS and uploaded them online for all us TMNT fans. Well, here they are again! Give it the old Sewer Den try - plug in your TMNT earbuds and give this silly soundtrack a listen. And do it while tackling your boring routine. Hopefully, the seasonal sounds of a 90s kids' video will make you merry. The earbuds boast that they're "high definition," a feature I didn't even know was possible with audio. Whatever level of quality the manufacturers were aiming for, they failed. The sound depressingly burps out of the mini-speakers. Muffled, tinny noises make all music sound like it's from a 90s VHS, which I guess is perfectly fitting for the We Wish You A Turtle Christmas soundtrack. That's why this combo is making onto the Cowabunga Christmas countdown! 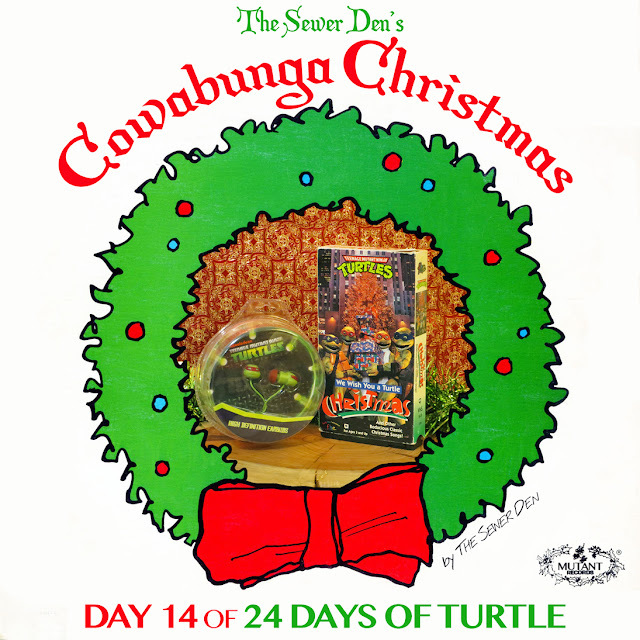 Check back tomorrow for DAY 15 of Cowabunga Christmas! Can't wait until then? Take a trip with the Ghost from Christmas Past to see what The Sewer Den put on display on December 14th in 2013 and 2014.